Looking for a nursery idea or two for your new baby but have no idea where to even start? I scoured the internet looking for some ideas for you and found this celebrity baby nursery (swoon). Like to save money and time? But as usual, I’m putting my own spin on it to save you some time and money. 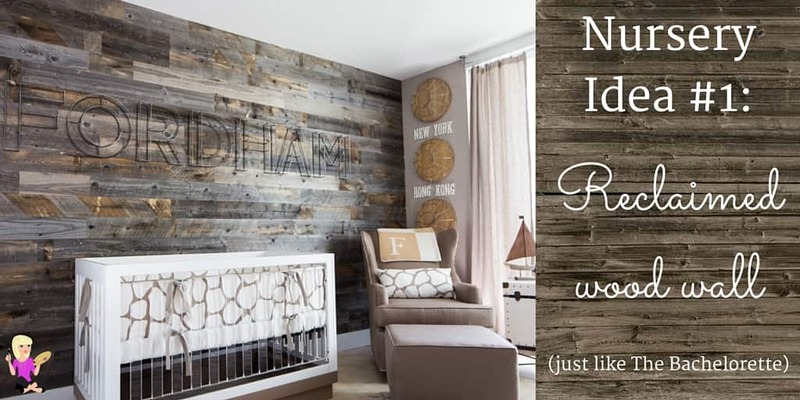 How about a reclaimed wood wall like Fordham Rosenbaum’s nursery? Celebrity designer, Vanessa Antonelli, designed this very organic, natural looking baby nursery for parents Ashley Hebert and JP Rosenbaum – any Bachelorette fans out there? (P.S. the beautiful photo of the baby nursery was captured by Ricky Stern Photography and it was saved from @thenessalee on Instagram). It features a gorgeous reclaimed wood wall that is to die for – how’s that for a nursery idea? 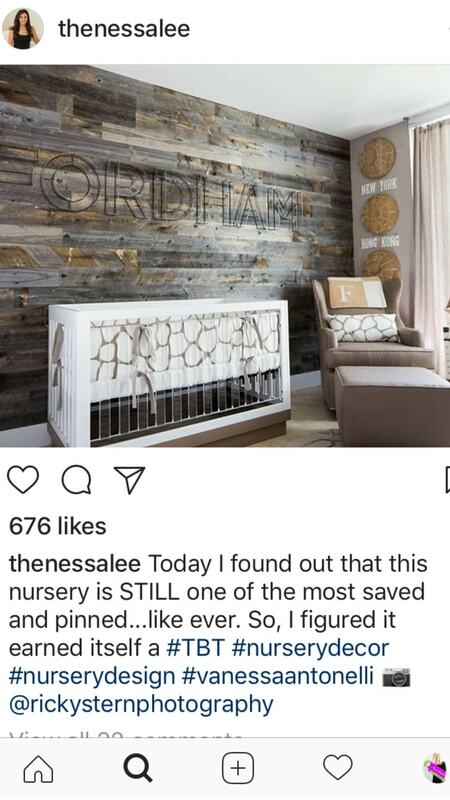 Apparently it’s still one of her most saved and pinned nursery ever. I do see one BIG problem though. Well two. Actually, it’s three. First is that a wall like that – in real reclaimed wood – costs thousands. Which is cool if you have the budget. We just installed a reclaimed wood bar in our kitchen that costed us $350 and it was just a tiny piece. Ouch! The other part is that it’s pretty permanent. It’ll be hard to take that reclaimed wood wall out later…and who knows what damage it will cause to the drywall. I guess the other thing is that if you’re renting, a landlord might not let you hang a wood wall like that. BUT you can get that look with wood wallpaper. Here’s one that I sell that looks almost identical to the real thing! So crisp and clear you’ll have to touch it to believe it’s not real! Totally removable so it’s easy to redecorate when your baby is ready for a new room. Eco-friendly with no harsh odours or VOCs, so it’s safe to put up in your baby’s nursery. Easy to hang, perfect for you DIYers! Reasonably priced, especially compared to the real thing. On the fence about removable wallpaper? Don’t believe me? Grab wallpaper samples! Don’t believe it looks like the real thing? Need to see it up close? You can always order a wallpaper sample. Looking for a hot deal on wood wallpaper? Join my newsletter community and I’ll let you know when all my sales are happening (and maybe even a few extra coupon codes). You’ll also get more ideas and photos of my wallpaper in action (in real customer’s homes) and DIY tips.